The Gloria Cycles are right on top! We are keeping abreast of the times! Having doubled the size of our Works, we are now in a position to place on the market an exceptionally high-grade ‘Gloria’ at the lowest possible price. The patronage and expressions of appreciation we have received in the past, have given us great confidence in our venture. We shall embody in the ‘Gloria’ material of highest quality, and they will be finished in our usual lavish style. 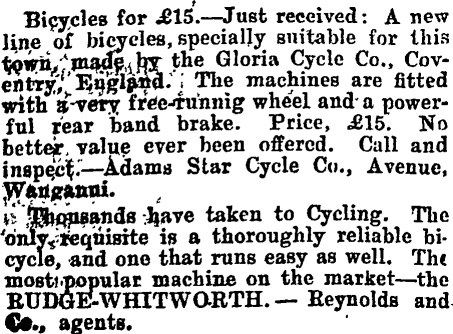 The Gloria Cycle Co was apparently set up in Coventry in 1898. I’m not sure at what stage Gloria became a subsidiary of Triumph, or whether it was a Triumph company from the outset, but Triumph used both names for their bicycles, the Gloria name being used for cheaper machines. 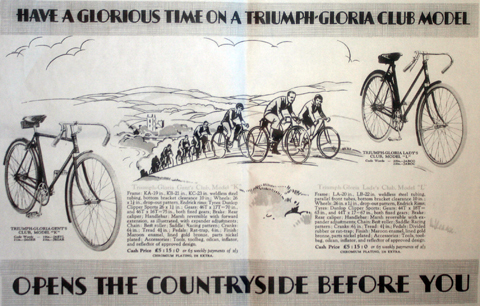 This is the first published study of The Triumph Gloria bicycle. Many thanks to Andrew Heaps for sharing his knowledge on them, as well as his 1906 Gloria catalogue. The location of Triumph frame numbers is unique – stamped on the top of the bottom bracket. I was intrigued when I obtained my first Gloria, as it had many Triumph features; but if it had been a Triumph its frame number would have made it a 1904 model, which it obviously was not. Andrew explained that Gloria frame numbers are a separate sequence from normal Triumphs. 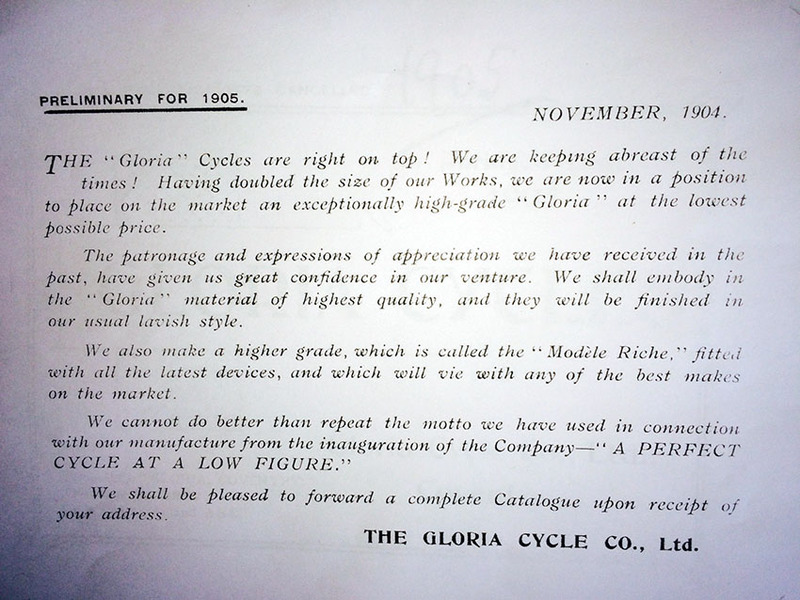 While it is possible to confirm the age of Triumphs from their numbers and catalogues, no records have been kept for Gloria Cycle Co, so we must use other means to date them, eg their Sturmey-Archer gears. 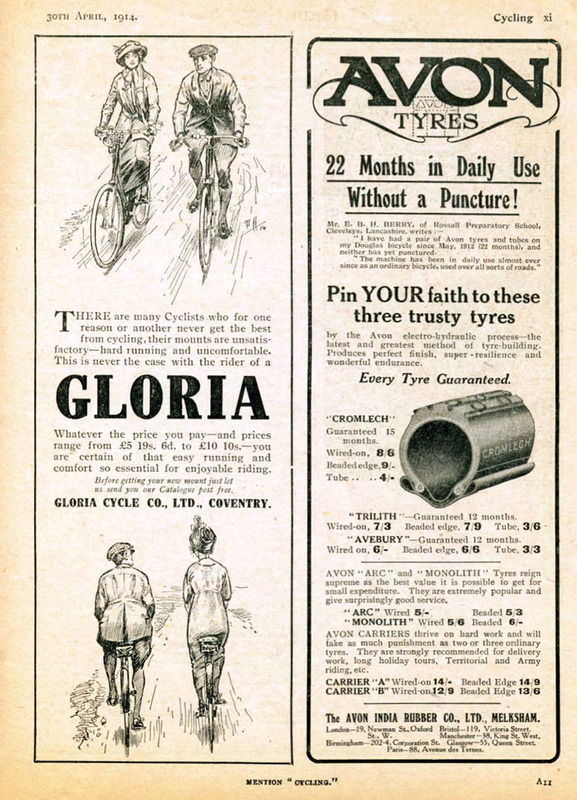 The 1913 Gloria has a common ‘bought-in’ chainwheel. 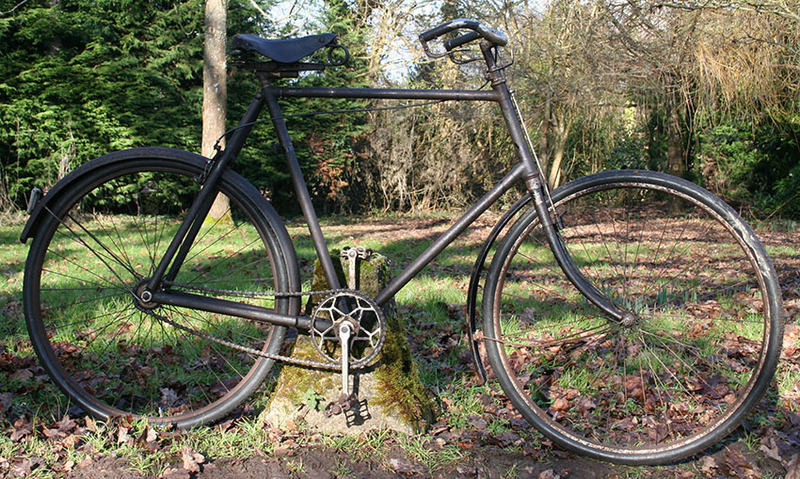 It also has a Sturmey-Archer ‘FX’ three-speed and roller levers for brakes. The 1915 Gloria has a six-pointed star chainwheel (as illustrated in the 1906 Gloria catalogue) and Triumph inverted levers. 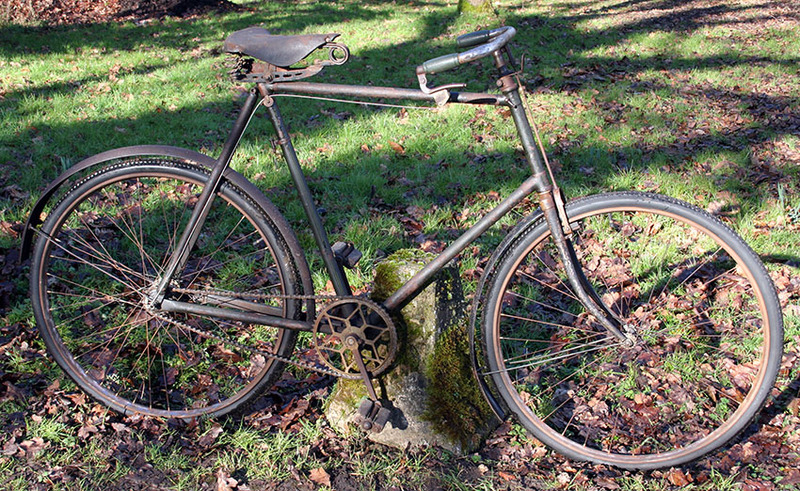 The 1918 has a Triumph pattern chainwheel, Sturmey-Archer ‘FN’ Tricoaster, and Triumph inverted lever. 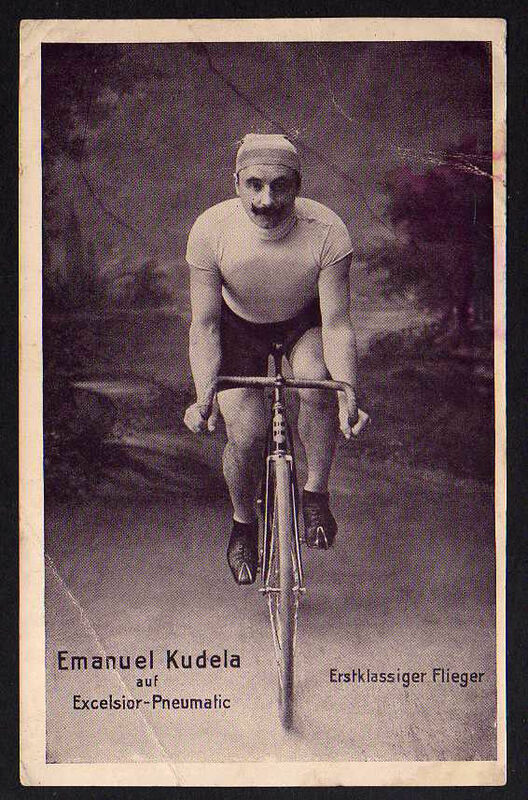 The location of the frame number varies: the first two are stamped like conventional Triumphs, above the bottom bracket; on the 1918 it is stamped below the saddle like most other manufacturers. In estimating the age of the three early Glorias, I have assumed that their numbers, like Triumph serial numbers, are in sequence. 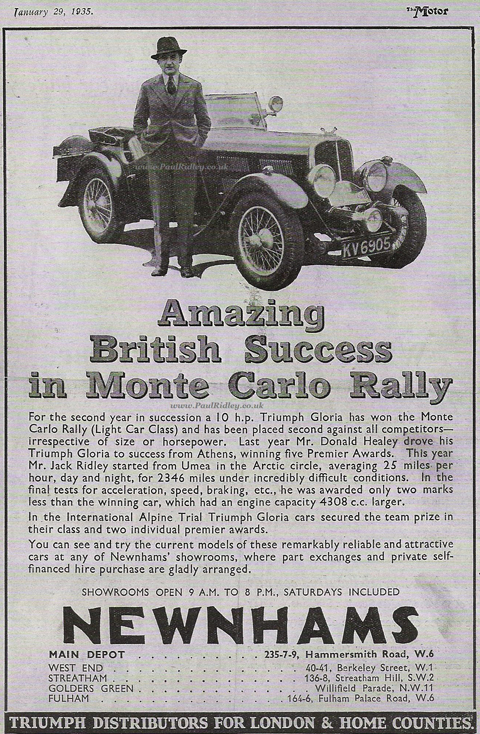 Triumph increased production during WW1. The company was a major government contractor for the supply of motorcycles and bicycles. 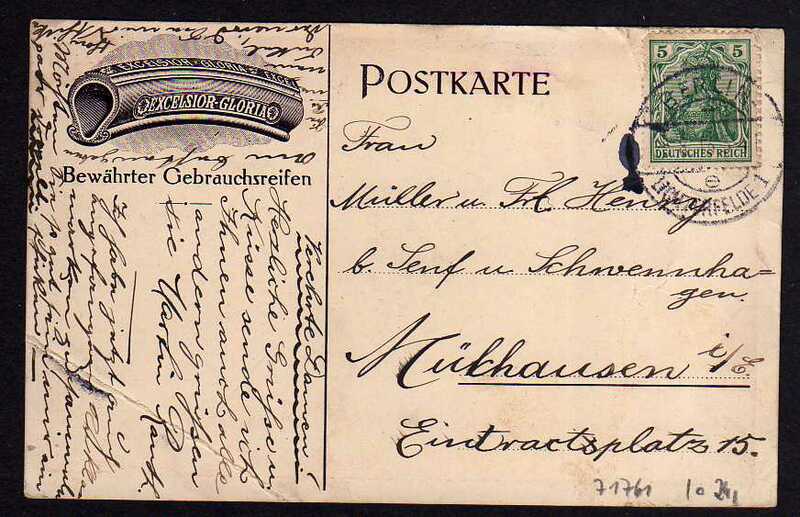 With all motorised transportation need for war, there was great demand for bicycles at home. 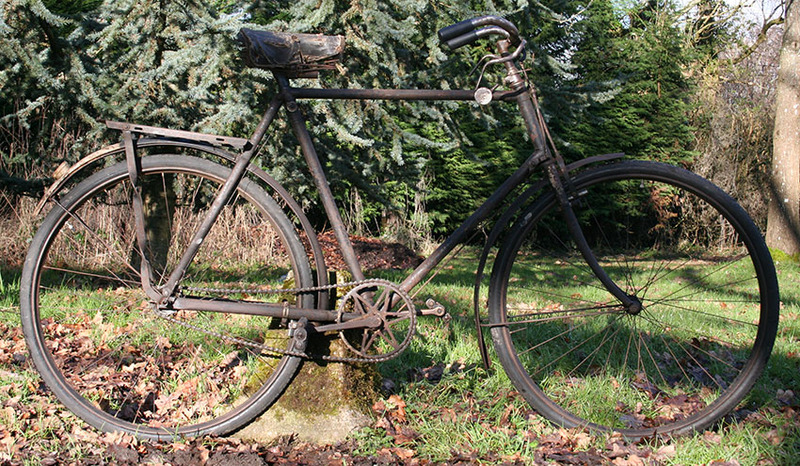 So it is no coincidence that the majority of surviving Triumph bicycles are from the WW1 era. 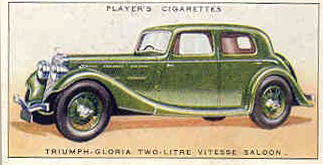 The fourth Gloria is from 1931 and retains its Gloria transfers.